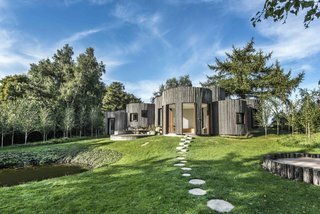 The island of Møn in Denmark has a remarkable landscape with dramatic white-chalk cliffs, so it’s fitting that Birkedal—a vacation rental property not far from the beach—features a shape and form that matches its impressive locale. 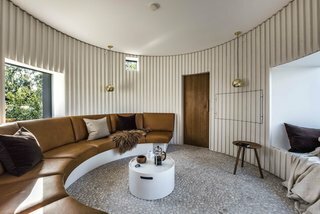 After taking five years to build, the 990-square-foot house was completed in 2016 and is now available to rent through Urlaubsarchitektur. 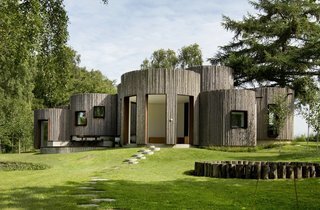 It was designed, built, and furnished by Copenhagen-based, German architect Jan Henrik Jansen, who designed two other holidays homes on Møn before Birkedal. 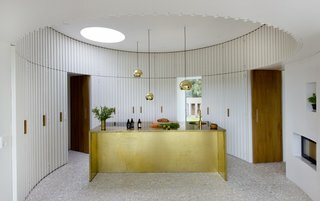 The house consists of nine interlinked, cylindrical structures that create circular rooms and communal spaces. 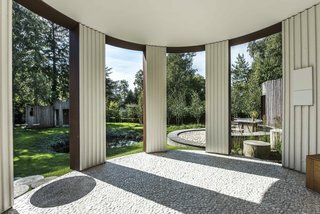 Each of them look out to the landscape through square or rectangular windows of various sizes. Surrounded by birch trees, Birkedal sits on a mound that slopes downward towards a wooded area and neighboring meadows. 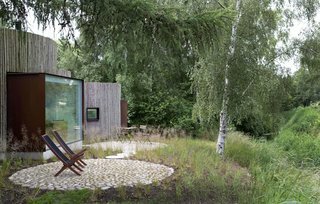 The site's concealed location in the middle of a bunch of birch trees is what gave Jansen the idea of creating a sanctuary in a clearing, where the house and a separate sauna building would stand like small spruce stumps, blending in discreetly with the surrounding trees. 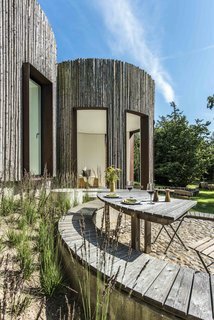 The curving exterior walls of the structure are clad in thin, natural pine logs, and fitted with rusted, Cor-ten steel window frames. 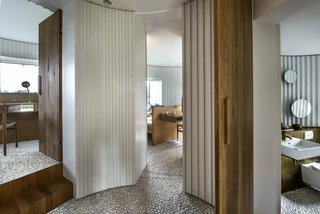 Each of the nine cylindrical volumes was conceived as a cocoon-like container, so all the rooms have a cabin-like coziness. 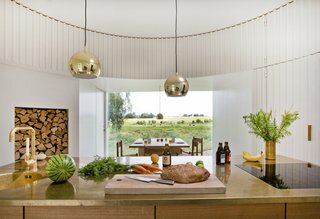 Plus, every window presents expansive views of the landscape. 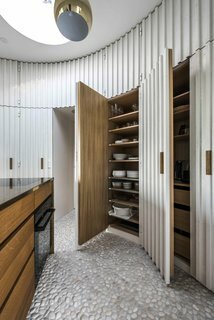 The interior walls are clad in rough-sawn strips and planks, which are painted a brilliant white. 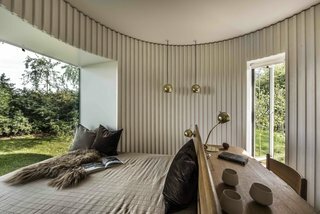 The bright, white walls within provide contrast to the blues and greens outdoors, allowing the colors of the scenic landscape to become part of the interiors. 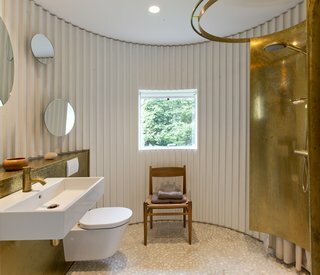 A mosaic floor made up of beach pebbles, oiled-oak furniture and fittings, and brass lamps bring just the right amount of rustic, Danish charm to this unique modern home.